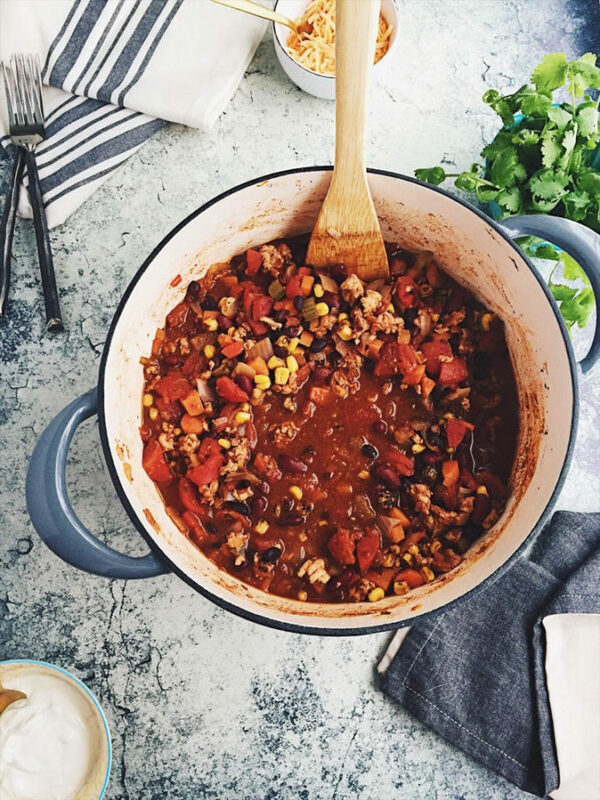 This healthy Turkey and Bean Chili is hearty, comforting, and perfect for a chilly winter day. It uses a special ingredient of raw cocao to balance and mellow the spices. As I type this, I’m sitting in bed and hiding from the world underneath the comfort of my blankets. I’m sipping my second cup of coffee and watching the snow fall outside. Large, powdery flakes are falling ever-so-slowly and reacquainting with its friends—a layer of eight to ten inches that’s fancying to form a foot. It looks nearly surreal from the comfort and warmness of my bed. The slow-motion snow fall, the stillness, the quiet. I can see the snow-covered tips of the 100-foot pine trees in our yard and in the distance and the cotton candy-like fluff of snow that’s accumulated on the window sill. All of it seems awfully post card-like. Of course, that’s the positive approach to this blizzard. If I were to talk about the negative aspect, I might begin telling you about how our car is stuck somewhere a few blocks away and about how they haven’t plowed our streets for days. Or about how we had to walk to the grocery store this morning. Or the fact that my short-legged-and-ill-equipped-for-snow Corgi is absolutely dying of boredom and driving me nuts. But I’ll stick to the more positive, prettier side of things (for now). Included in that list would have to be this healthy Turkey and Bean Chili. I’m currently thinking about the fact that I have leftovers for lunch and how it’s even better the next day. 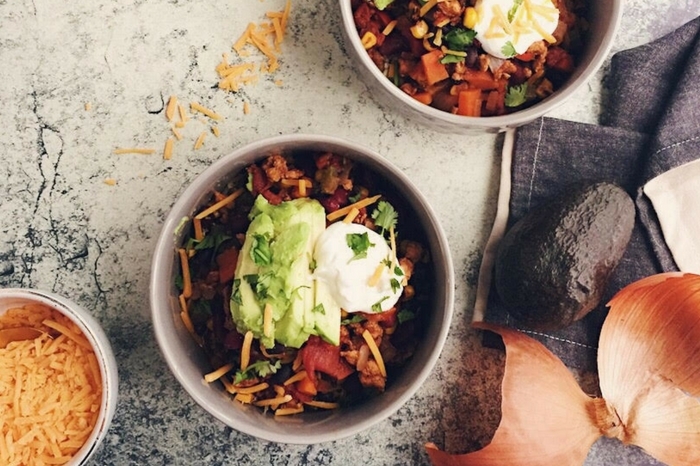 Chili is the perfect winter comfort food. So hearty, satisfying, and warm. 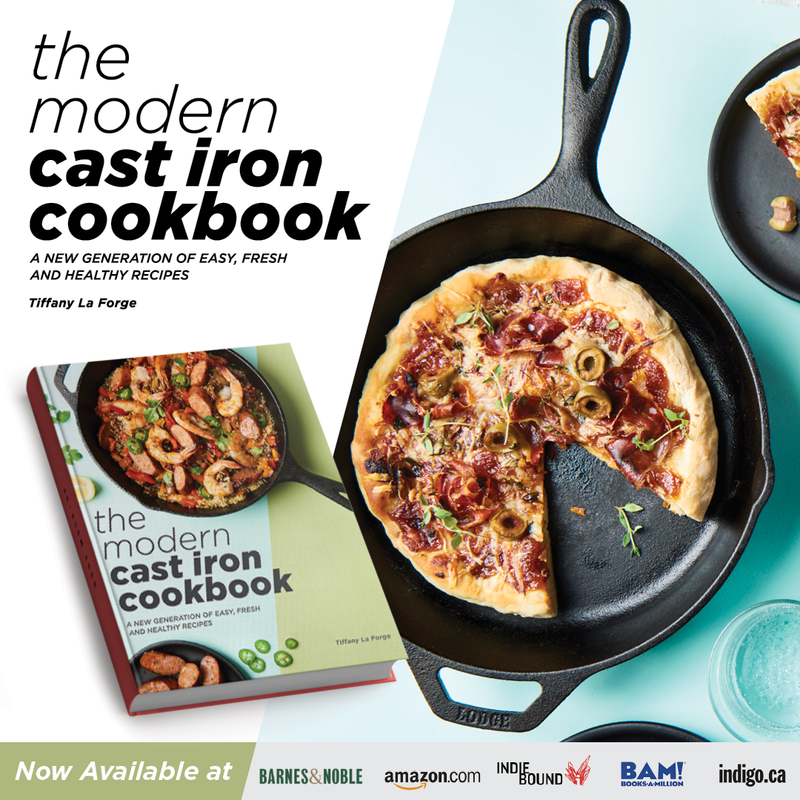 The perfect cozy-up-with food, begging you to ladle it into a deep bowl and travel with it to a couch that’s waiting with your favorite throw. I definitely always wing-it when it comes to chili. 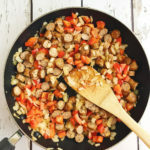 It’s so easy to make and a perfect excuse for when you want to make a throw-together meal or use up some ingredients. 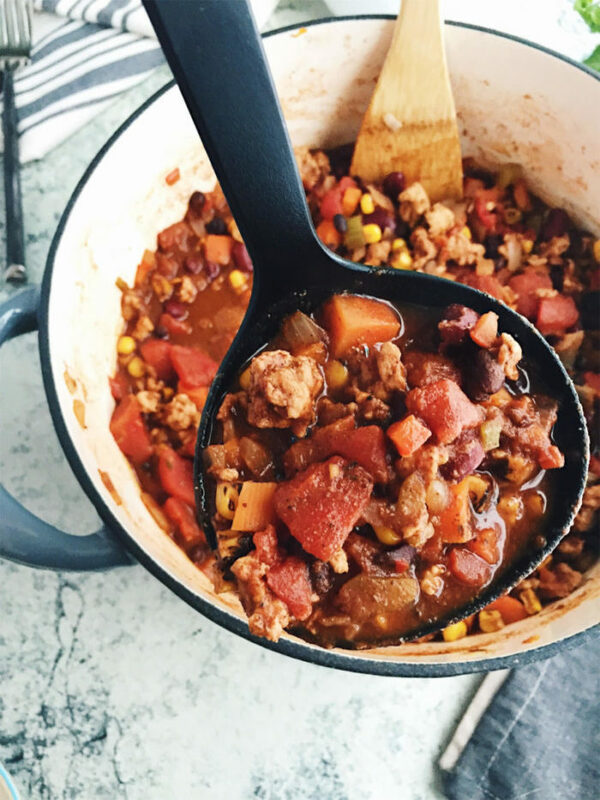 But this time I decided to write my favorite version down—this healthy turkey and bean chili. It’s delicious, crazy-hearty, and it comes together in under 45 minutes from start to finish. It uses a secret ingredient (which I guess isn’t so secret anymore) of raw cocao. It incorporates a hefty tablespoon of this delicious, raw, organic cocao powder. Which you can get at Whole Foods or (for the best price I’ve ever seen it) on Amazon. It doesn’t give the chili a chocolate-y taste, but rather, it adds warmth and mellows out the spices. And speaking of spices, there’s plenty of them to go around. Chili powder, smoky paprika, cumin, oregano, cayenne, etc. etc. etc. But it’s not overly hot. I’m a baby myself when it comes to spices, and I think this chili is just right. 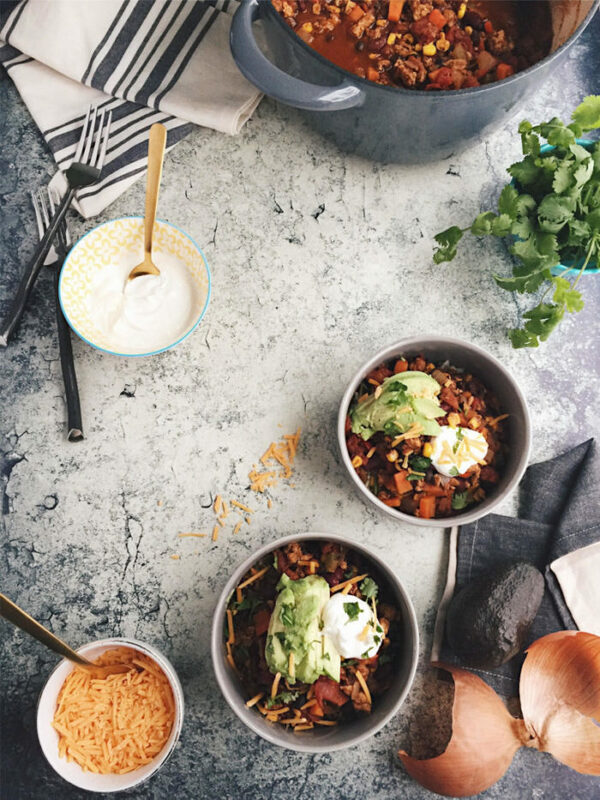 And it’s even better when it’s topped with just a little sour cream, cheddar cheese, fresh cilantro, avocado, and lots of love. 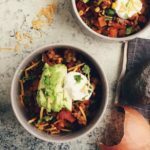 This healthy turkey and bean chili is a balanced and wholesome dish with plenty of protein, fiber, and healthy fats. 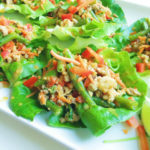 I use Jennie-O Extra Lean Ground Turkey Breast and tons of nutritious veggies. 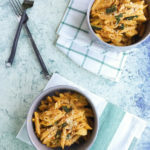 Plus, the one-pot convenience is perfect for an easy weeknight meal to feed the whole family. What do you say we get cooking? Disclaimer: I received complimentary Jennie-O product for this post, but this post has not been further compensated in any form. As always, all opinions are my own. 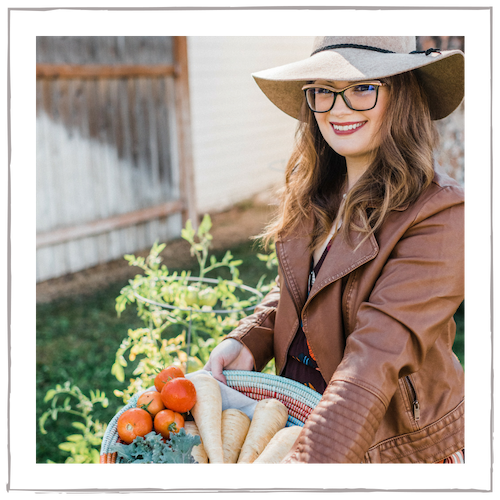 This post contains affiliate links, but are always products I highly recommend & use myself. 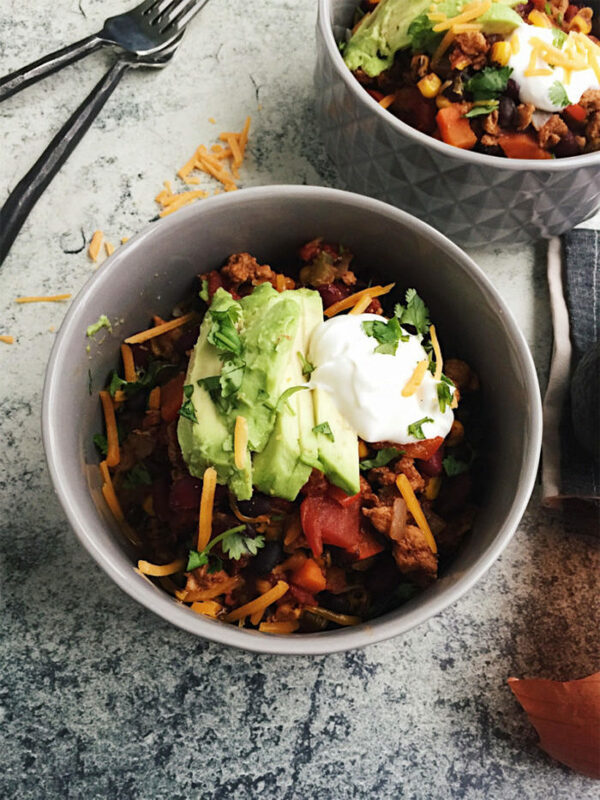 Healthy, hearty and immensely satisfying turkey chili is loaded with veggies, fiber, and spices. Raw cocao powder helps mellow the heat, while making this an easy, flavorful dish. Heat olive oil in a large pot and saute onion, carrots, bell pepper, celery, and garlic until softened, but not browned. About 5-7 minutes. Season with sea salt and pepper. Add the turkey to the pot and cook, breaking up with a wooden spoon, until no longer pink. Stir in chili powder, cumin, oregano, cayenne, cocao powder, paprika, chili flakes, and a generous pinch of sea salt + pepper. Cook for 2 minutes until fragrant. Stir in can of diced tomatoes, chicken broth, corn, and beans and bring to a boil. Reduce heat, cover, and simmer for about 30 minutes to let the chili thicken and deepen its flavors. 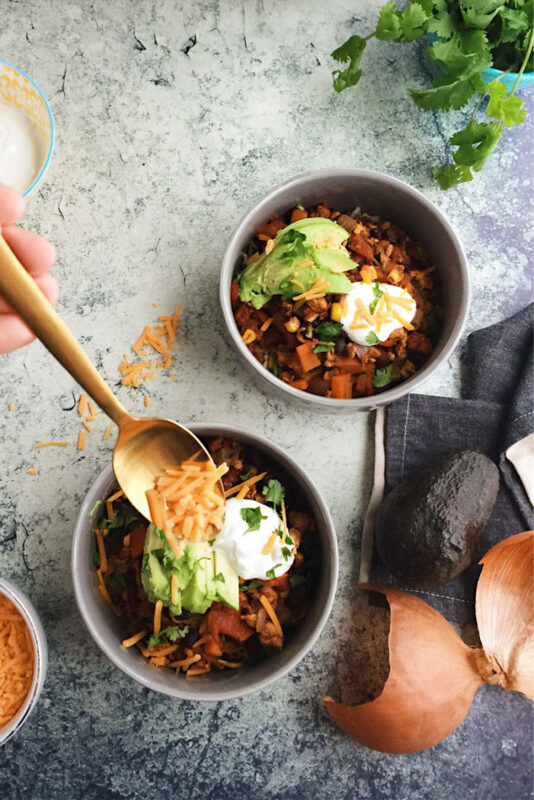 Serve on brown rice, topped with fresh cilantro, cheddar cheese, light sour cream, avocado, and/or crumbled tortilla chips. Enjoy! Is this the chili you made me that one time and then I always asked for it when we were still neighbors?! If so….YESSSSS!!!!!!!! I’m running home and making it NOW! It is!! <3 Let me know if you make it and how it comes out!! 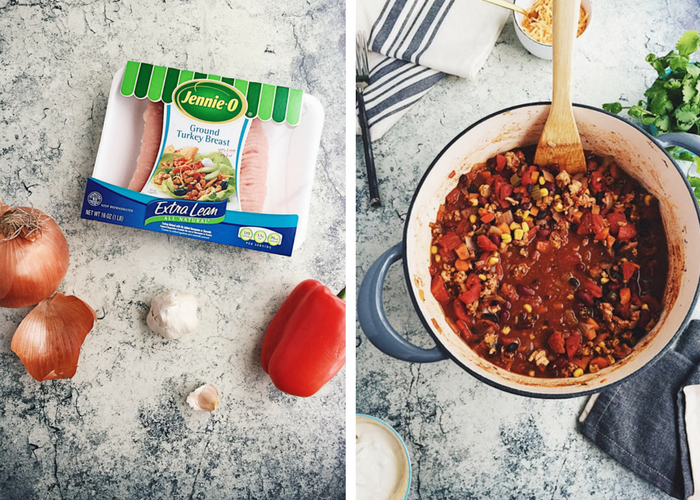 LOVE a hearty chili, especially this time of the year when the cooler temps sneak in! This sounds delicious! Thank you, Cindy! 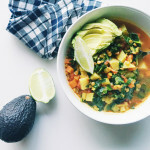 Chili and soups are my absolute favorite this time of the year, too! Gosh, nearly a foot of snow??! 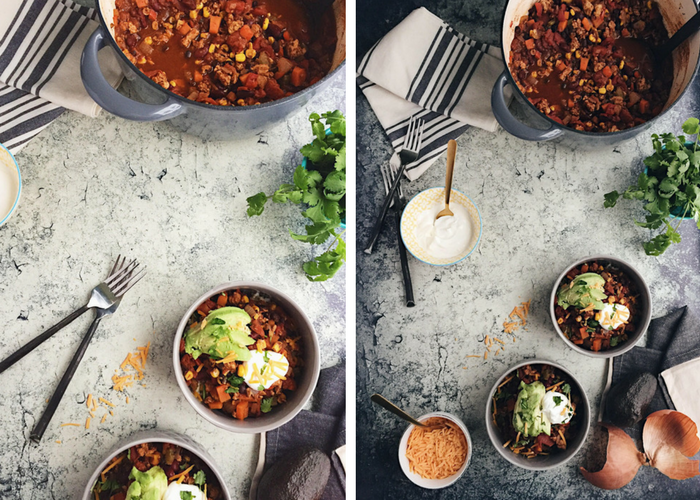 It’s great that you are warming up with this lovely chili! 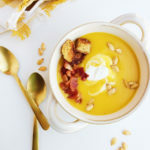 A cozy winter dish we all need! This is a great chili! The cacao gives such a wonderful flavor! Different and delicious. 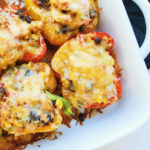 Great chili for superbowl! Thank you! I love the cocao in this dish too! 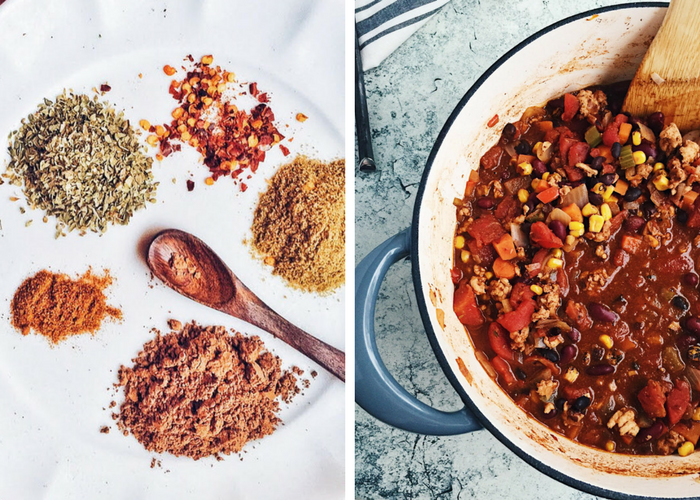 Oh I love a good chili especially one that is on the healthier side! Oh this is perfect for the cold weather we have coming to us this week. Can’t wait to warm up with it while reading a book or something cozy.